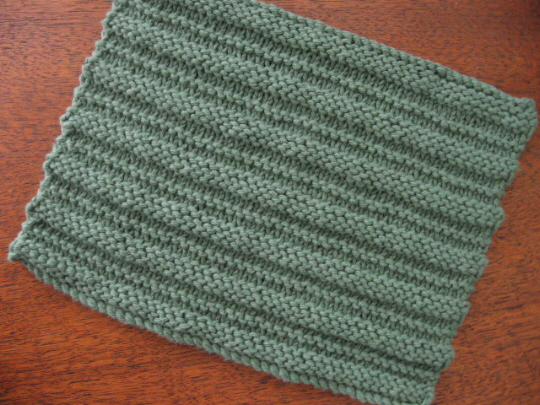 This dishcloth is based on the Quaker Ridging stitch in Barbara Walker's A Treasury of Knitting Patterns. It makes a beautifully simple cloth. 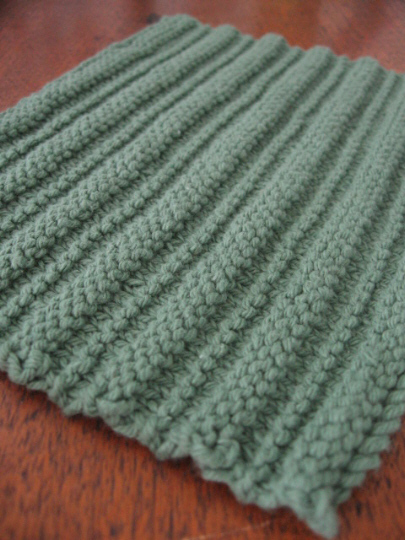 Materials: 1 ball Lily Sugar 'n Cream in color 00084 Sage Green; US 5 (3.75mm) or 6 (4mm) needles. Gauge: about 5 sts per inch/2.5 cm. Finished size: approx. 7 x 5 in. (18 x 13 cm). K 2 rows, P 1 row, K 1 row. Rows 1, 3, 4, 5, 7, 8, and 10: K.
Rows 2, 6, and 9: P.
Rep these 10 rows 6 times more. K 1 row. Bind off loosely, and weave in ends. Note: The cloth will shrink a little vertically with use and washing. An extra pattern repeat has been added to make up for this. I love this dishcloth! Beautiful!